The Maltese Islands’ clear blue waters are ideal for scuba diving. All three Islands offer some unique diving experiences with an abundance of reefs, caves and wrecks that make diving here some of the most interesting in the Mediterranean. The calmness and clarity of the sea makes for excellent visibility and offer the ultimate conditions for underwater photographers and first time divers. 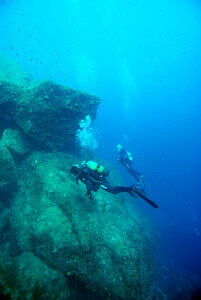 For the more experienced divers, there are plenty of challenging dives to choose from. 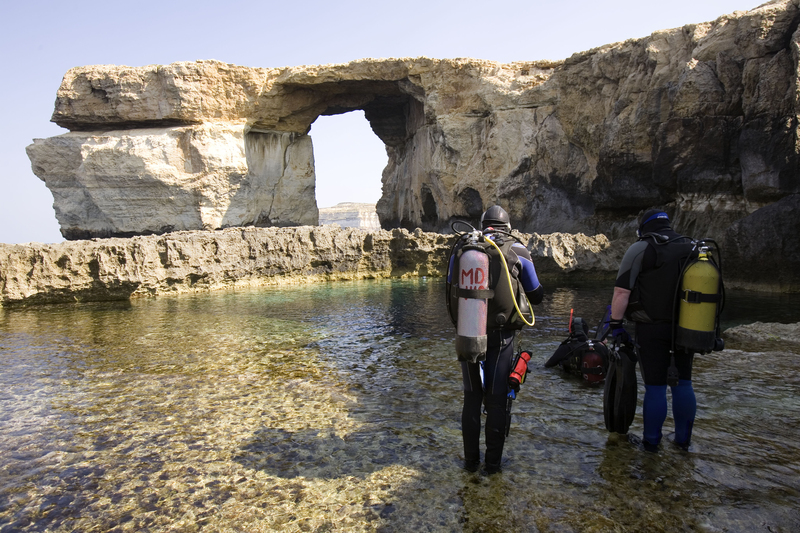 The depths of the dives vary, from the very shallow 12 metre Għar Lapsi dive to Lantern Point, with its underwater tunnel leading down to well over 50 metres. 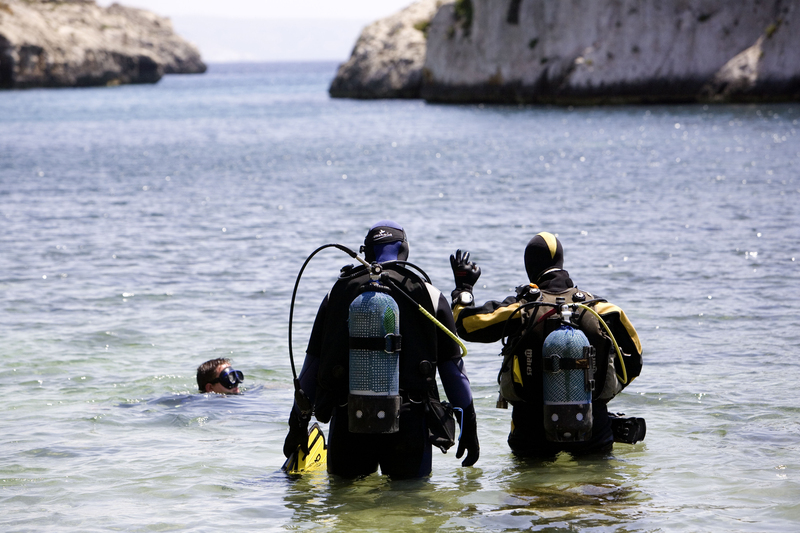 There are several types of diving courses and activities offered by locally licensed dive schools. Divers need to complete a medical statement form indicating fitness to dive. All dive schools provide the service of a doctor to provide certification at a small fee. Medicals from other countries are acceptable, provided the dive centre is presented with a copy. Divers who wish to dive unaccompanied are required to have a buddy as well as to present a PADI Advanced Open Water or equivalent certification by other agencies (e.g. CMAS Two Star Diver, BSAC Sport Diver, SSI Advanced Open Water, etc). It is always recommended to check with the dive centre as to where would be suitable to dive, depending on weather conditions and experience. *All photos by Peter Lemon (unless otherwise stated). This is an ideal location when strong north-easterly winds prevent diving in many other areas. Entry to the water is from a pier. The bottom slopes gradually, reaching depths of 28 metres. 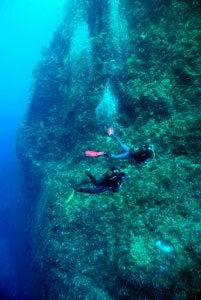 The seabed is covered with some extremely large boulders, which provide some very interesting swimthroughs and curious formations. These are ideal for octopus, groupers and reasonably larger fish. Approximately 150 metres from the bay is a large cave. The floor is at 10 metres and divers can easily surface inside and admire the dome-shaped ceiling, which is rich in red algae. A little beyond the cave is a large window through the top of a prominent rock. Throughout the dive parrotfish are commonly seen, as well as medium sized groupers, and occasionally Moray eels. The Carolita Barge is reached from Manoel Island in Marsamxett Harbour. To reach the wreck, divers should swim in a south-westerly direction at any depth between 10-15 metres. 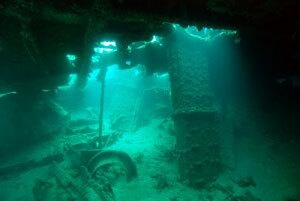 The seabed around the wreck is muddy and scattered with objects such as hospital beds, wheelchairs and other objects thrown into the sea during and after the war. The torpedo damage at the stern of the vessel is quite extensive. Throughout the dive, octopus, small groupers and thousands of damselfish are encountered. Situated in the north of the island, this location has long been a favourite among local divers, mainly for its impressive drop-off from 8 to 30 metres. The area boasts a picturesque arch and a number of caves. The arch is a cavern which has a large hole in the top, creating a narrow bridge of rock under which divers can easily gain access. 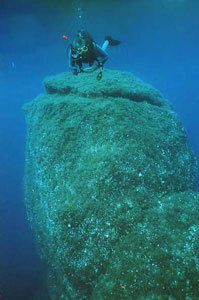 At the tip of the Delimara Peninsula, past Marsaxlokk, is a small square rock which indicates the diving area. An underwater reef commences at a depth of about 9 meters and drops gradually down to 12 meters where one discovers a vertical cliff down to 25 meters. There is also a cave and a vertical tunnel right back to the top of the reef. The bottom is littered with some large boulders. Amongst these you can see the elusive grouper. Beyond these on the seabed of open sand, stingrays are often seen. Throughout the dive, various other fish and marine life can be seen. This is the north-eastern point of Malta. There are a number of caves at the surface, inside of which there are several tunnels. The entry is a narrow inlet with depths from 3 to 10 metres. After a 10 minute snorkel, two options present themselves – to the left, a reef rich in marine life and an impressive drop-off, and to the right, an underwater entrance to a large cave. Throughout the dive there are plenty of cardinal fish, bright corals and red sponges. In the Maltese language ‘għar’ means cave. Għar Lapsi is a fishing hamlet on the southern coast. Access to the water is easy. Within a few strokes from the entry point is a shallow system of underwater caves lit up with beams of sunlight from the numerous exits. The Għar Lapsi area is mostly in the 15 to 20 metres depth range and offers a large area of parallel reefs and depressions with most of the typical marine fauna of the Mediterranean. The site is found below fort St. Elmo, in front of a cafe which has its outside walls covered with a number of painted Destroyers, amongst which is the HMS Maori. HMS Maori was launched in 1937, and saw considerable action in the Mediterranean, the Norwegian campaign, Atlantic convoys and the North Sea. On February 12th 1942, the HMS Maori was moored at the entrance to Dockyard Creek, when she received a direct hit in her engine room. She was eventually set down in the back-water of St. Elmo’s Bay, on the sandy bottom at a depth of around 18 metres. Her guns were removed and the bow and stern are gone, however part of the raised bridge is still there. 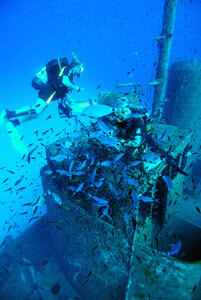 Divers can enter the remains quite easily, with exits through large holes in the starboard side. Although silted up, there are plenty of different types of fish and other creatures amongst the wreckage, which is covered with greenweed and tube worms. This reef lies off St. Julian’s Bay. 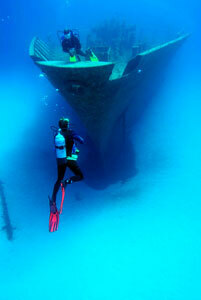 A boat dive is recommended although stronger swimmers can easily reach it from land. The many nooks and crannies house a variety of fish and other good photographic subjects. 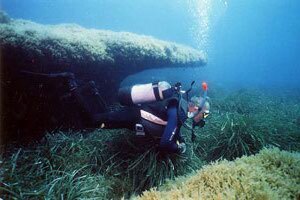 The Margit (originally known as the MV Odile) was an old steam-freighter that sank following a bombing attack on April 4, 1942 at Kalkara reef, off Grand Harbour (Valletta). The wreck was discovered in the late Seventies. The hull is in poor condition because it was devastated by the explosions (the bow and the propellers are missing), and lies on its port side. The wreck covers a large area and is difficult to find in poor visibility without local knowledge. 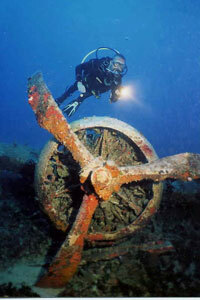 It is recommended that only experienced divers actually penetrate the wreck as proper equipment including reels are needed. This is the southern tip of St. Paul’s Bay. A large Roman anchor was recovered from the sea in this area. The profile drops slowly at first and the monotony of posidonia meadows gives way to a steep slope to 40 metres. Here many weird-shaped sponges show their magnificence by the light of a torch. A large C-shaped cave often inhabited by brown meagre and bream completes this long dive. The steep slope of the valley continues underwater. The bottom is strewn with rock which must have been carried there over the centuries. At the right of the mouth of the valley is a small cave. The bottom falls to 30 metres plus. The location comes to its full glory at night as crabs, hidden during the day, venture forth. These islands are at the western entrance to St. Paul’s Bay and the only way of reaching the islands is by boat. There are various dive sites at St. Paul’s Islands, including the location where St. Paul was thought to have been shipwrecked. Although there is nothing to show this, there are other remains such as some plates and ribs from an old destroyer and a small ferry sunk purposely in 1984. Another dive is St. Paul’s valley, found between the two islands. The seabed is made up of white sand and is covered in boulders and Posidonia, where numerous wrasse can be found. Between the seagrass, broad-snouted pipefish can also be seen. At the North of Malta there is Marfa Point. Here there is an old metal jetty, and approximately 135 metres out from here lies the tugboat Rozi. The maximum depth of this dive is 36 metres. 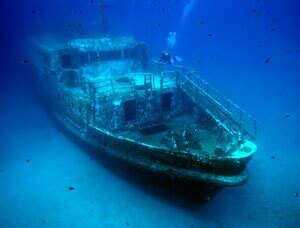 The Rozi was a 40 metre tug deliberately sunk in 1991 as an underwater attraction for glass-bottomed boat tours. The Rozi sits upright on the sandy seabed, intact except for its engines and propeller. 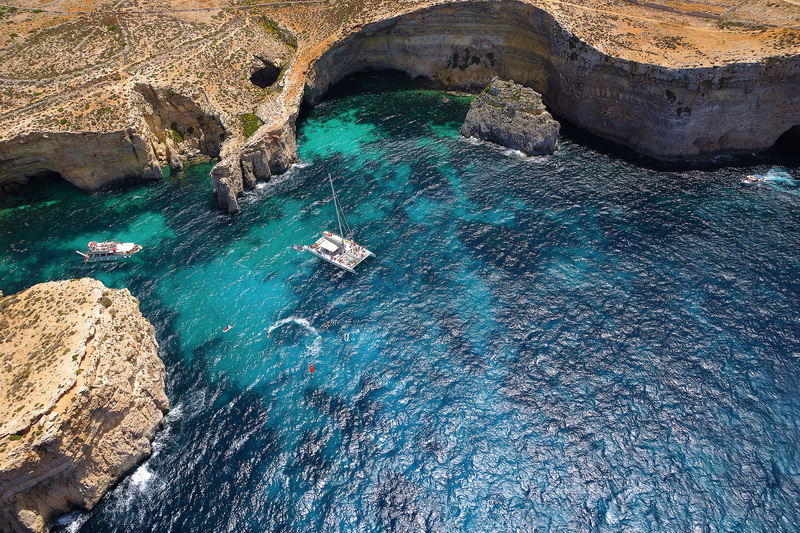 This is one of the most popular dive sites on the Maltese Islands, with much to see and explore. The ship is surrounded by thousands of fish, including seabreams, scorpionfish, rainbow wrasses and cardinal fish. The Um El Faroud was sunk in 1998 following a terrible explosion on board that killed nine Maltese dockyard workers. Having remained in the harbour of Valletta for three years, it now sits upright on the sandy seabed Southwest of Wied iż-Żurrieq with the memorial brass plaque above the front windows of the helm. The Um El Faroud weighs 10,000 tons and is 115 metres long. The depth to the top of the bridge is 18 metres and 25 metres to the main deck. Divers might come across some squid and barracudas at the stern. The port side is usually teeming with large schools of sea breams, parrotfish and silversides. Sometimes one can come across the occasional amberjack and tuna. The wreck can be entered fairly easily, but due to its size, this should be restricted only to divers with advanced wreck diving training. Wied iż-Żurrieq is a valley on the south coast of Malta. The steep slope of the valley continues underwater. Entry is from a small quay. The bottom is strewn with rocks which must have been carried there over the centuries. At the right of the mouth valley is a small cave. The bottom falls to 30 metres plus. The Imperial Eagle was one of the ferryboats connecting Malta and Gozo. The hull lays on a sandy bottom at a depth of approximately 42m, 300m North-East of Qawra Point. 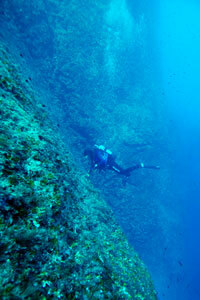 The wide hold is open, and the wreck allows an easy and interesting dive. Close by is a statue of Jesus Christ. This 13 ton statue was reallocated here in May 2000. 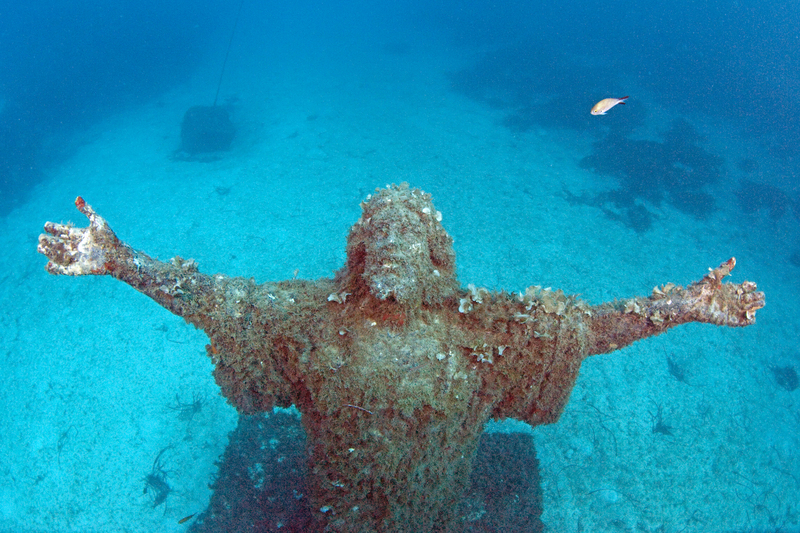 It was originally sunk near St. Paul’s Islands and blessed by Pope John Paul in 1990 to protect the fishermen of Malta. This site is a small bay southwest of Mgarr. Access is generally from the shore. The dive starts across a wide horizontal ledge, about 9 metres deep, which is covered with seaweed where sprats and sardines can be found. At the edge, the ledge drops down to around 22 metres, where the seabed is covered in boulders ranging from small ones to extremely large ones. Apart from providing habitats for small octopus, goatfish, seambreams and more, these rocks also act as swimthroughs. Throughout the dive, you might also see parrotfish, scorpionfish and shoals of damselfish. 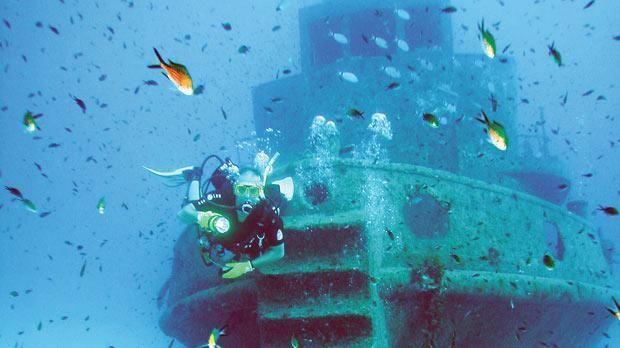 In 1999, the Gozo ferry boat, the Xlendi was sunk at Xatt L-Aħmar as an artificial reef. The crocodile-shaped rock is just offshore between Dwejra Point and Fungus rock. It can be reached both by boat or from the rocky shore. Heading westerly towards the left of the rock, you will find a square shute pointing towards the deeper water, revealing a steep cliff. The cliff drops vertically down to 38 metres, where the seabed is covered in boulders. In this area one can see groupers and shoals of salema. Keeping the cliff-face to the right, you will eventually reach the Coral Cave. This is a huge semi-circular opening with 20 metres across the sandy bottom, at a depth of around 22 metres. Within the cave, using a torch, you can see different types of coral sponges, virgin lace, and the quite rare marine goldfish. 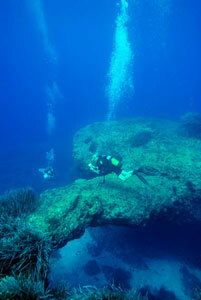 This dive site is found a short distance to the east of Xwieni Bay, on the north coast of Gozo. It requires a 200 metre swim in a northerly direction, where a drop-off is reached. 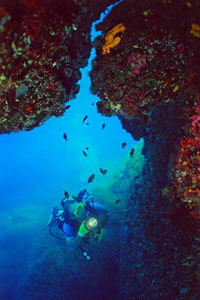 Nearby there are two distinctive holes through a vertical rock face, which are known as Double Arch Reef. The top of the rock is at a depth of 16 metres, whilst the rest goes down to a depth of 36 metres, with the lower arch being the larger of the two holes. 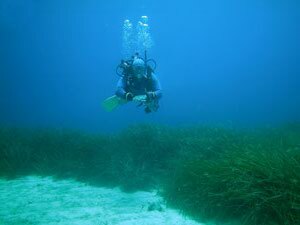 On the way you will encounter seagrass inhabited by cuttlefish, octopus and even the seahorse. Often a large shoal of small barracuda can be seen in this area. 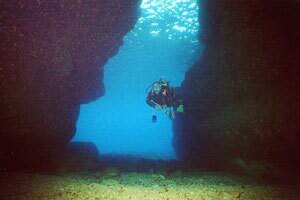 This dive site is located between Reqqa Point and Forna Point, on the North coast of Gozo. Ghasri Valley is a spectacular deep cut which widens as it reaches the sea. 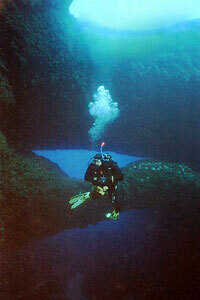 This dive site is also known as the Blue Dome or Cathedral Cave. 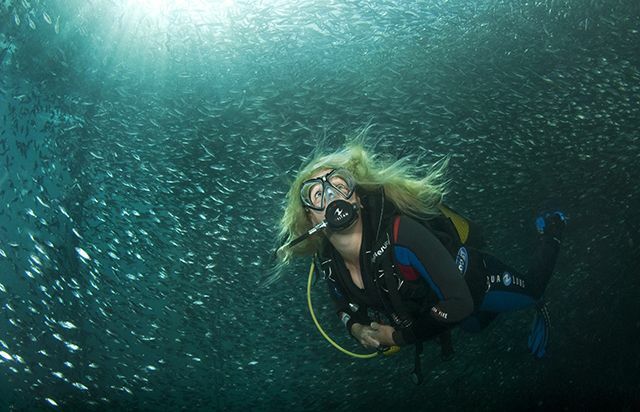 This dive is ideal for all levels of divers. It commences on a shingle beach where the water is shallow, but becomes deeper at a maximum depth of 30 metres. The seabed is covered in anemones, and large boulders covered in algae, sea urchins and starfish. You can also sea damselfish, seabreams, and scorpionfish, and might even come across a seahorse. The cave itself is only 5 metres below the surface and leads through a domed vault, where divers can surface and breathe freely. The seabed of the cave is covered in boulders, but the most impressive part is the view to the outside ocean. Towards the end of the valley, at a depth of approximitely 20 metres, an encounter with octopus and/or groupers is entirely possible. This site is located inside the western entrance to an inlet called Mġarr ix-Xini. At the western side of the inlet a number of rare fish can be seen, such as the flying gurnard, the red gurnard, the star-gazer and, if you’re lucky, the John Dory. Other species include seabream, scorpionfish, small octopus and large cuttlefish. There are also two caves. On entering the caves you can see anemones and even some shrimps hidden amongst the walls. The seabed away from the cliff face consists of coarse sand, with occasional seagrass, above which rarer fish are found. The caverns at 10m and 16m in this bay can be reached from both Mġarr ix-Xini and Ta’ Ċenċ. The cliff continues underwater to a depth of 30 metres where it gives way to large boulders. These provide ample hiding places for groupers. This dive site is very popular with photographers due to a variety of species of fish, from gurnard, stargazers and even seahorses. There is also a cave, inside which one can surface. This is the northernmost tip of Gozo. The beach road is rough, the entry is tricky with a strong swell, but it is a fantastic dive. 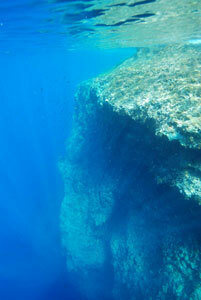 The reef consists of a parapet at a depth of 30 metres and then a drop to 60 metres. However, there is an excellent vantage point at 15 metres. Here you will quite literally find yourself in a cloud of small fish feeding on the nutrient-rich waters. Large shoals of dentex have feeding frenzies, and groupers are large and plentiful. Adding to this, there are large caves and deep water. 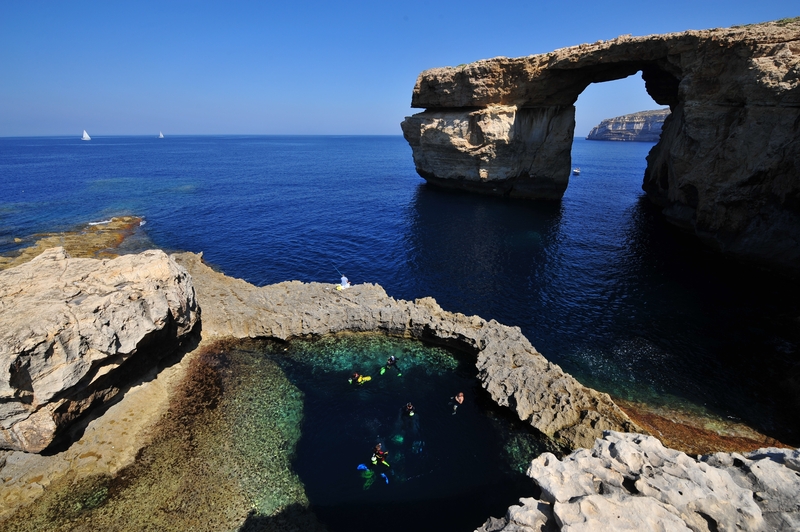 This site is located in front of the Azure Window at the bottom of Dwejra Point. It is a shore dive, which is reached via a fairly difficult walk over rough coralline limestone; however, steps have been carved into the rocks leading down to the Blue Hole. This is a natural rock formation carved out over the centuries by wind and waves which goes down to a depth of 26 metres. The hole is about one metre above sea level and no more than 10 metres wide and 5 metres across. However, a few metres down, this gives way to unlimited access to the sea on exiting a huge archway. A large cave can also be found at the bottom of the hole. The Chimney is entered one diver at a time through a fissure in the almost vertical rock. This opens up at a depth of around 8 metres. Througout the dive, one can see various species of fish, starfish and bristle worms. This dive is perfect for photography. Xlendi Reef is located in the middle of Xlendi Bay. Part of the reef forms a pinnacle, which reaches up to within a metre of the surface. The reef is covered with seaweed and small fish. You can also see large numbers of damselfish, small groups of grey mullets as well as various species of wrasses and seabreams. The base of the reef is littered with large boulders. The reef comes to an end below the steep cliffs. Billingshurst Cave is found to the west of Reqqa Point in the Northern part of Gozo. The top of the cave entrance is just above the surface and the bottom is at 27 meters. A long tunnel called The Railway Tunnel leads to another cave deep inside the rock where divers can surface. Entry is from Reqqa Point. 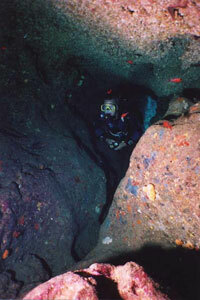 Immediately inside the cave there are plenty of red sponges, soft corals, cardinalfish and other types of marine life. On the way back, the sight of the blue open water with the sun shining through from the outer reef is breathtaking and perfect for silhouette photographs. This dive site is found offshore from the Mgarr ix-Xini inlet along the south shore near Mgarr Harbour. Fessej Rock is a tall, circular and vertical column of rock which rises about 15 metres (50 feet) above the water and plunges vertically 50 metres (165 feet) to the seabed, amidst a number of huge boulders. The average depth of the dive is 30 metres (100 feet), and you can encounter large schools of fish, tube worms and squat lobsters, dentex and amberjacks. Barracuda, tuna, grouper, octopus and other lobster can be found on this dive too. Fungus Rock is a huge rock in Dwejra Bay, on the western coast of Gozo. Access is only by boat. The average depth is 40 metres. This isolated rock has a hole running through its northern area. Underwater, the scenery is as impressive as above, with vertical walls, fissures, gulleys and caverns created by boulders, which provide an excellent habitat for the largest groupers. Looking upwards, one can often see tuna, amberjacks and barracudas. The walls of the rock are covered in algae, sea urchins, tube worms, starfish, bristle worms and sea potatoes, with their brilliant red colour. San Dimitri Point is at the most westerly point in Gozo. It is an imposing rock jutting out from the shore, and is only accessible by boat. The first part of the dive is quite gentle, after which you will come across a large boulder with smaller ones littering the seabed at a depth of about 30 metres. Throughout the dive you may come across large shoals of barracuda. Grouper, dentex and damselfish are also commonly seen, as well as octopus and moray eels. Cominotto is a smaller island off the north-west corner of Comino. Northwest of Cominotto is an underwater reef. This is a boat dive with good anchorage. The average depth is 18 metres and the maximum depth is 36 metres. 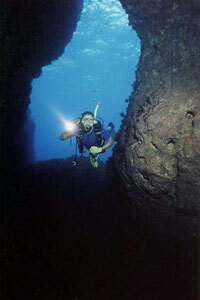 During the dive you will come across massive boulders with interesting holes and caverns, where creatures such as burrowing anemones and peacock worms hide. There is also an abundance of tube worms, soft corals and red sponge, which add colour to these shaded areas. A strip of land on the southwestern tip of Comino with a sheer drop-off to 40 metres. The water is clear and the cold currents support large shoals of sardines and bogue that are preyed upon by amber-jacks, dentex and, sometimes tuna. The boulder strewn depths reveal families of bream and brown meagre. 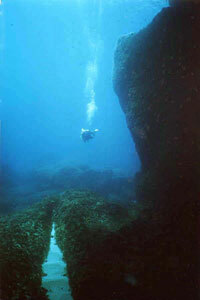 This dive is a boat dive and starts from a shallow rocky shelf at 6 metres, where the boat usually anchors. Above the entrance to a ‘chimney’, an almost vertical tunnel drops down to 16 metres. The tunnel is wide enough for divers to manoeuvre without touching the sides, where many fireworms reside. Outside the tunnel and slightly to the right, divers can enjoy a maze of swimthroughs underneath the massive rock, where starfish can be seen. Behind the large rock, there are boulders, giving way to a gentle slope at about 50 metres. Nooks and crannies close to the seabed are home for large groupers and the occasional dentex. To find a dive centre in Malta, Gozo or Comino, visit www.pdsa.org.mt. This publication covers dive sites around Malta, Gozo and Comino based on the author’s experience of over 2000 dives in the waters of the Maltese Islands over a period of thirty years. It is a comprehensive full colour 224 page guide, with illustrated dive sites each with an aerial photograph, a local map and accompanying text. Boat dives are also featured. The book is well supported by many photographs; many of which are aerial, covering dive sites, marine life, wrecks, artificial reefs and places of interest. It is written with the accounts of the author’s experiences in scuba diving, local knowledge (having made more than 80 visits to the islands), and information aimed at the experienced independent diver as a guide, to those who require accompanied diving, or for the beginner as a souvenir. Clearly laid out, this A4 book takes you on a trip around the seas of the Maltese Islands. Below the aerial photograph is a three-dimensional map of each dive site, which is clear and easy to follow. They show the most favourable entry and exit points, depths and underwater landscape, helping to make each dive as stress free and as safe as possible, and is easy to read as the whole book is in a portrait format. Detailed sections cover most things you would need to know when visiting the Maltese Islands, including information on places of interest to visit for those days when you do not go diving. There is a comprehensive index, which means that you don’t need to spend hours trawling through the book every time you need to find something specific. 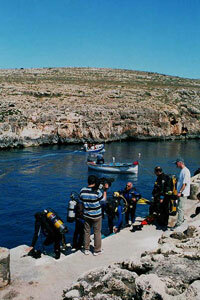 Buy the Ultimate Guide To Scuba Diving Malta Gozo Comino by Peter G. Lemon here. 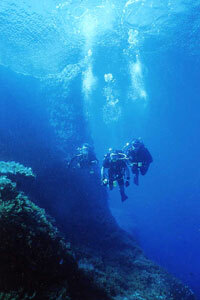 To find out more about the scuba diving that Malta, Gozo and Comino has to offer, go to www.visitmalta.com/en/diving.